This post contains a referral link, which if used will reward $5 store credit to each of us. Beautibi was featured here not too long ago when I placed my first order for a few masks. Beautibi also sells curated skincare boxes from time to time. This box released towards the beginning of the year and is call the aNEW Box, regularly priced at $92, it is on sale for $78 currently. This box was a gift from my husband. The box arrived fairly quickly and was packed well. The box itself is very sturdy and substantial. I have kept it in case I find I use for it down the road. 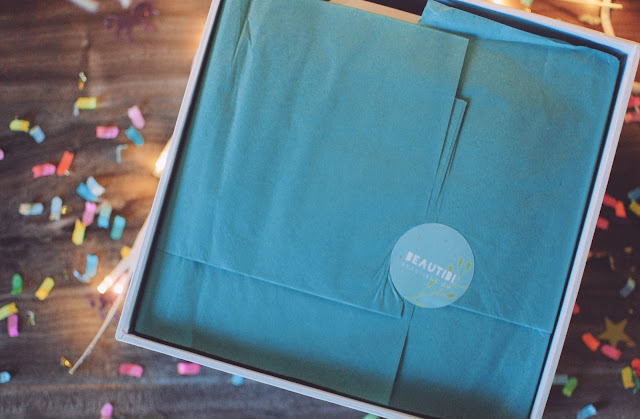 There are three aNEW box types to choose from: Soothing and Brightening, Hydrating or Balancing. I chose the Balancing one due to my oily and acne prone skin. 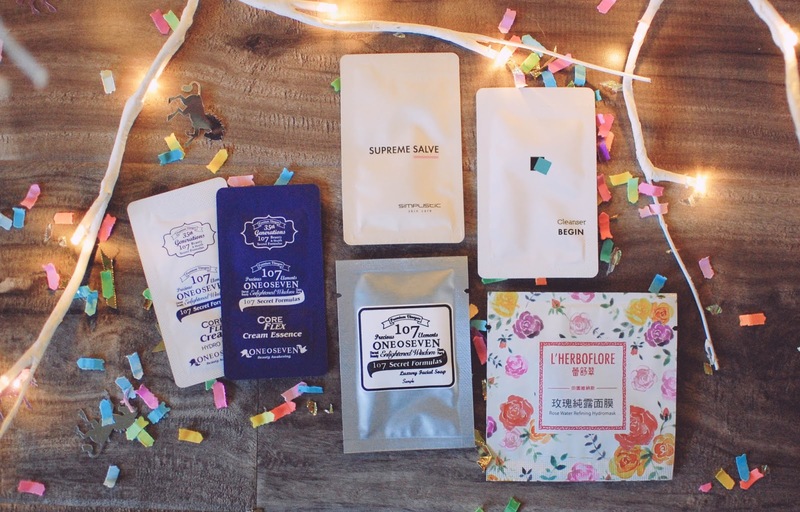 Upon lifting the lid, the box revealed two extra sheet mask freebies. Both are from MasKingdom and were obviously chosen with care as one is Balancing for problem skin and the other is an exfoliating mask. I love how beautiful the artwork on the Balancing mask looks. And I totally relate to the Exfoliating mask chick. After removing the masks on top the real unveiling begins. 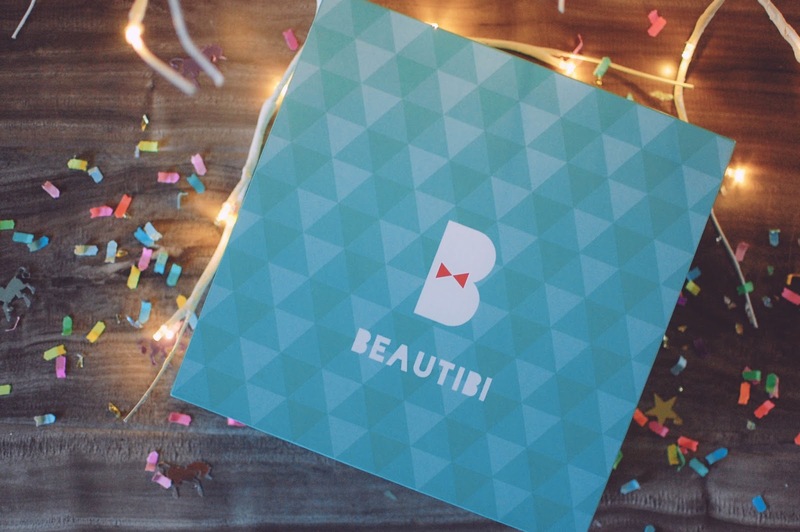 Beautibi has detail down to the letter. Breaking the seal showcased a "thank you" note, a placard with a description of all the products inside the box, and more free samples. 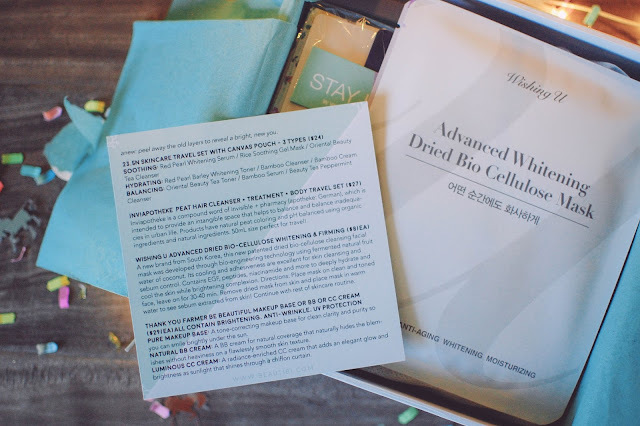 These Wishing U Dried Bio Cellulose masks are supposed to with draw impurities from the face in such a manner that if you soak the mask after use, you can see all the gunk it sucked out of your pores and off your face. I like junk like that. 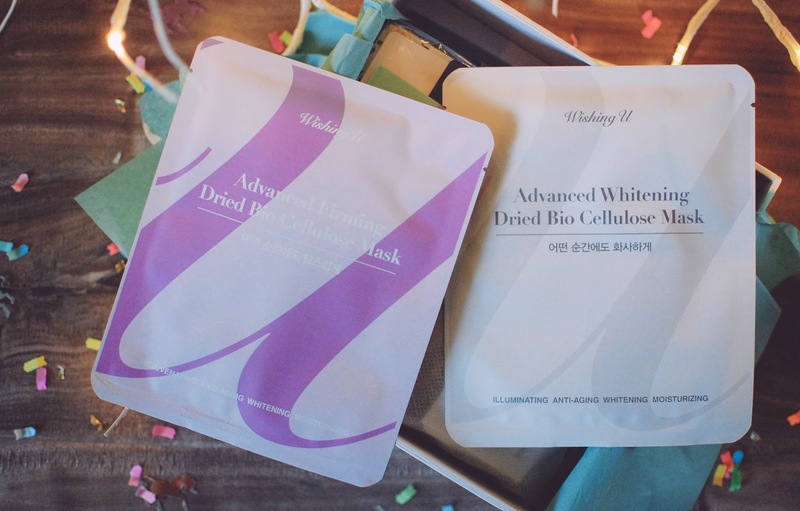 There are two types here, Advanced Firming and Advanced Whitening. These run at about $8 each. I have not tried one yet but I am looking forward to it. Underneath the masks, the box was perfectly packed with the remaining goodies in their own pouches, bags and boxes. 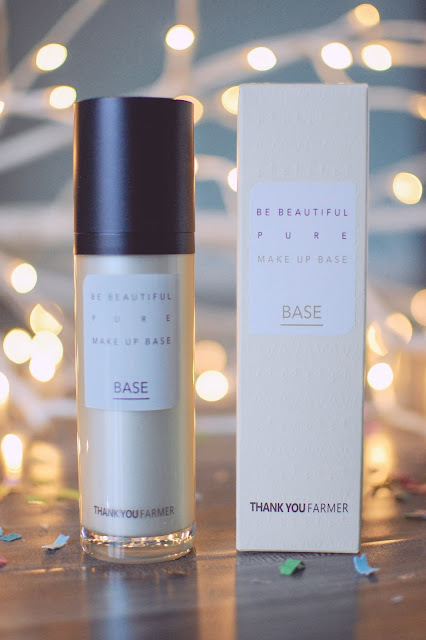 As part of the Balancing box, I received the Thank You Farmer Be Beautiful Pure Make Up Base. Other skin types acquired either the Thank You Farmer CC cream or BB cream (which I ended up getting a blister sample of these, anyway). Thank You Farmer is an up and coming Korean skin care brand (I think I heard they will be coming to Sephora soon). I am quite happy with this make up base, even though I initially felt it would be something I would not utilize. After trying a bit of this light mint green toned base I have fallen hard. It neutralizes a good chunk of my redness and discoloration from sun exposer and diffuses some of my acne scarring. After cleaning, toning and using a light moisturizer in the morning, I pat on one pump of this make up base and layer it with my NARS Tinted Moisturizer for my day to day face. This base has SPF 30 and feels plush and velvety smooth on my skin. Light as a feather, she is. I enjoy this enough to repurchase it for sure. ($29) If the BB, CC, or Base did not float your boat you can opt for the Thank You Farmer Peeling Cream. Pretty nice. 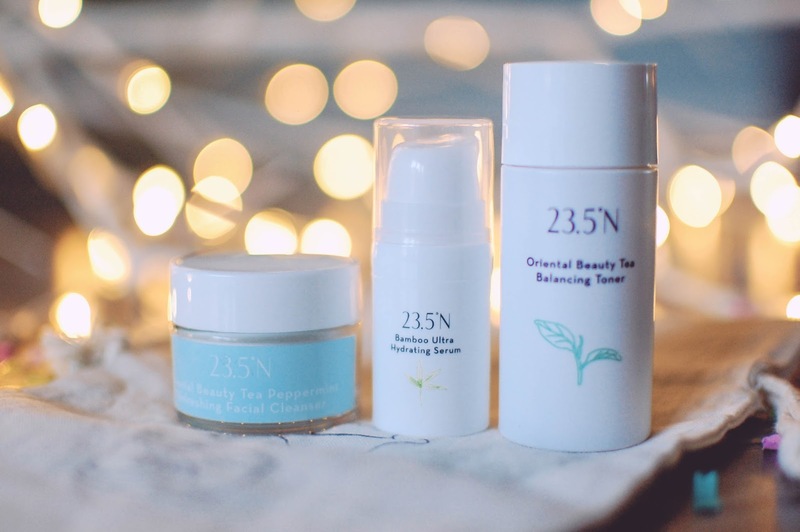 The next company highlighted in this box is 23.5N, a Taiwanese company that pays homage to the Tropic of Cancer (latitude 23.43706), also known as "The magical green belt of the tropic." Their products offer natural ingredients with no additives and simple recipes. 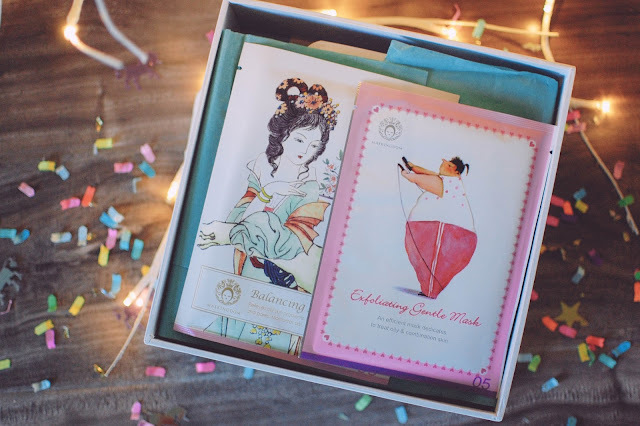 The Balancing box includes: Oriental Beauty Tea Toner, Bamboo Ultra Hydrating Serum, and Beauty Tea Peppermint Cleanser. 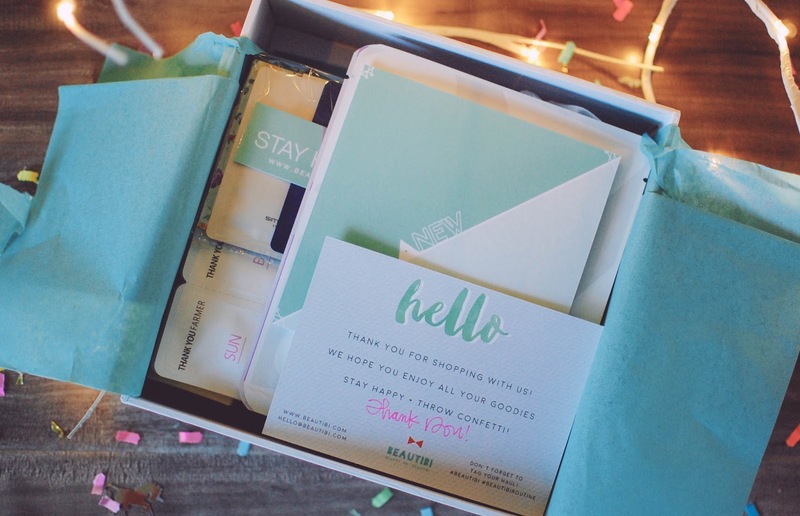 The other boxes received different items customized to their needs. ($24) I have not tried these yet so I kind of want to save them for traveling, as they are the perfect size to take on flights or trips. 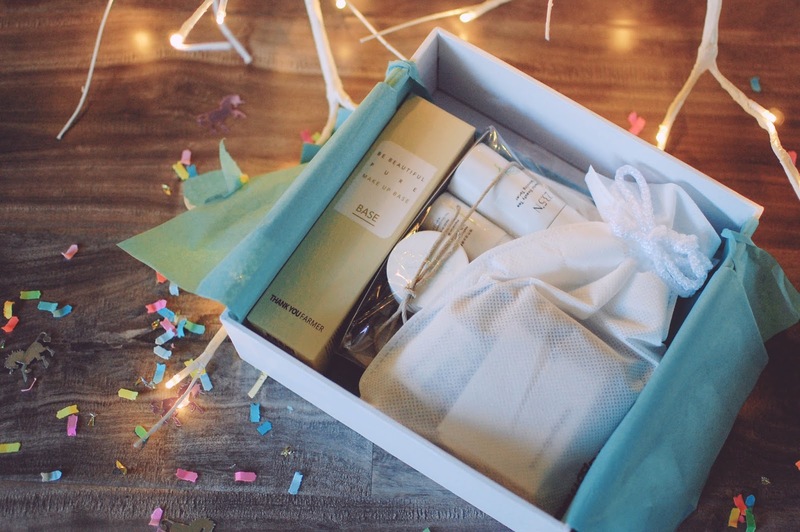 All three boxes incorporate this Invi-Apotheke Hair and Body Care Travel Set ($27). These bottles are pretty small, only 50 ml or about 1.5 ounces. They all boast peat as their distinctive ingredient, Peat Hair Cleanser, Peat Hair Treatment, and Peat Body Cleanser. Having read the Outlander series, I am pretty familiar with the uses for peat, from peat bricks for heart fires to gardening and wound care (if you are Claire Fraser). I never have personally been in a peat bog so I cannot account for its smell but apparently it is the hot new skin care ingredient du jour. I used all three in the shower the past few times and I must say, I really like the hair cleanser and hair treatment. The shampoo cleaned the oils from my scalp without leaving my already dry/damaged/thin hair feeling like a handful of twigs. The scent reminded me of earthy lemongrass. The treatment was moisturizing enough to let me finger comb but was not weighty or overly slippery. I did feel like I could use a touch more moisturizing but the next morning after it had dried it felt soft and bouncy. The body cleanser (and the hair treatment too) has the same earthy lemongrass aroma. It sudsed nicely and cleaned my body leaving a light layer of slickness that I had not expected. After toweling I still had the urge to put on lotion, so I did. They do give the pH balances of all the products (but I don't think I am savvy enough to know what my hair/body needs for its proper or ideal pH range so I ignored that) the hair cleanser is 5.5, treatment is 4.5 and the body cleanser is 4.5. They all sport organic aloe maculata leaf extract, around 20-30% essential oils and peat water. I would buy the hair items again, though Beautibi only sells the travel set. I have found a 256 ml bottle of the treatment for $41 on Shopee. A rather nice set of Thank You Farmer blister pack samples came in the box. 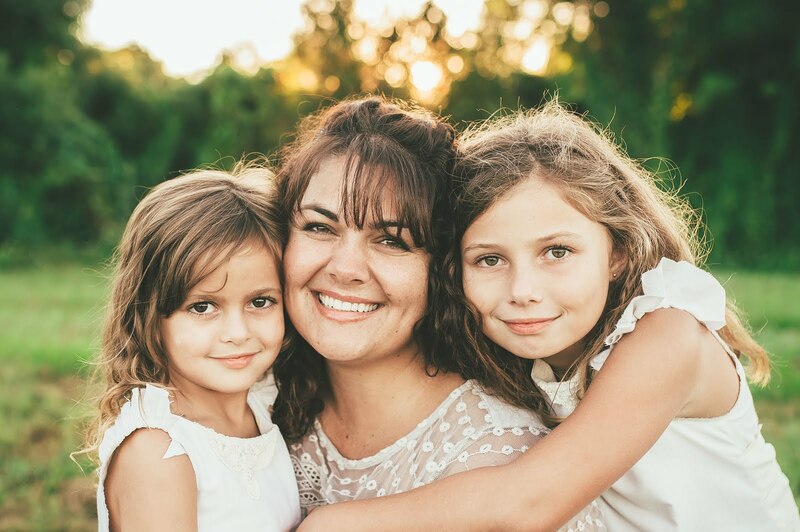 I have used the CC cream which my daughter said looked nice on my skin but I felt it was rather too luminous for day to day wear, but maybe nice for a beach vacation. 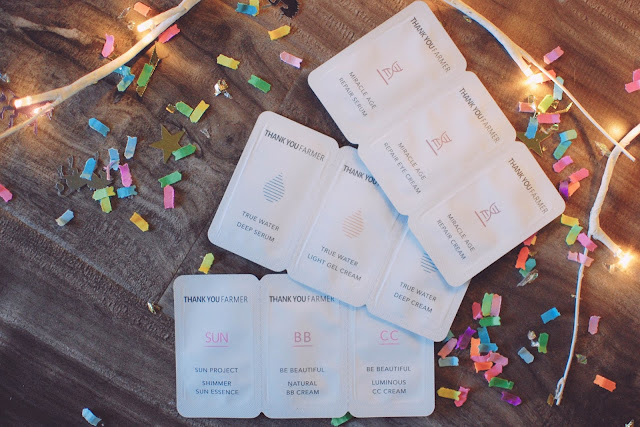 The rest of the samples from various skin care companies were nice too. I am happy to have another sliver of the 107 soap. Man, that stuff is good. 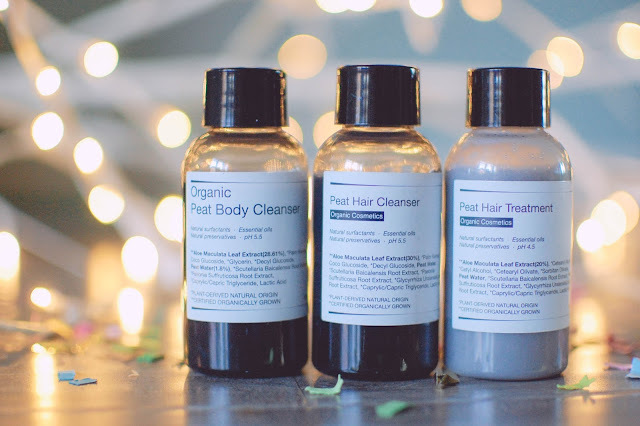 Have you tried any peat products? New skin care? New hair care? 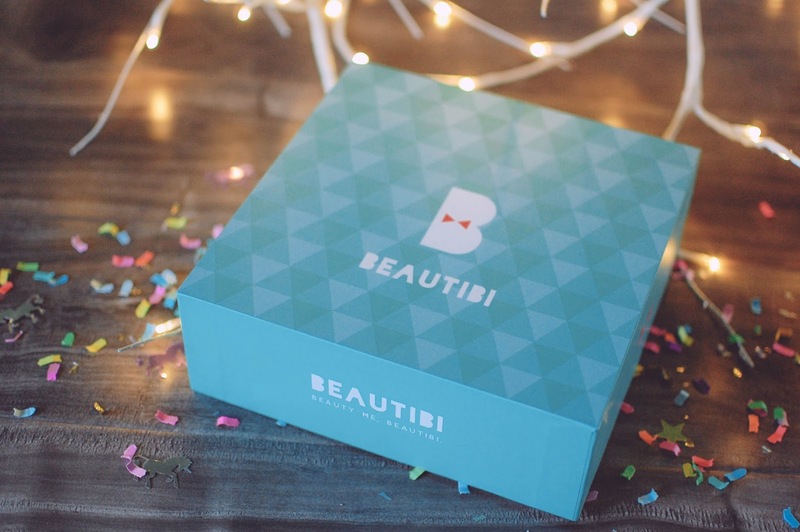 How do you feel about beauty boxes like this? Are you into Asian skin care?